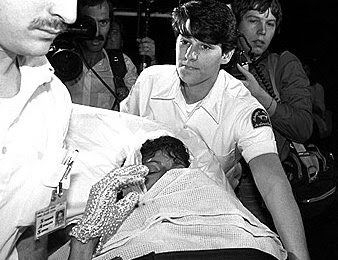 Us Weekly magazine has obtained a video that shows never-before-seen footage of Michael Jackson's head catching on fire during filming of his 1984 Pepsi commercial. Jackson suffered severe burns after a pyrotechnics mishap caused his hair and scalp to catch fire. Still photos of the accident have been seen before, but the new video on Us Weekly's website shows the moment Jackson's hair caught on fire and the top of his head became engulfed in flames. Jackson didn't realise his hair was on fire. In the video, he's still dancing as the flames are on his head. When he spins, the flames go out. People on the set tackle him to extinguish the fire, and his brother Jermaine Jackson, playing the guitar in front of him and oblivious to the commotion, turns around. When Michael Jackson emerges from the pile of people trying to help him, the top of his head is bald. The accident, witnessed by thousands of stunned fans at the Shrine Auditorium in Los Angeles, came at the height of Jackson's fame, about a year after the release of his best-selling Thriller album. It marked what would be the beginning of serious, lifelong pain for Jackson, who had been treated for painkiller addiction and has been described by relatives and friends as being hooked on pain medication at the time of his death last month at age 50. Jackson, who was photographed in an ambulance with a bandage on his head and his trademark sequined white glove on his right hand, required several surgeries and needed skin grafts to treat the injury. In his autobiography, Moonwalk, he described the cause of the accident as "stupidity, pure and simple." As he described the accident, he wrote: "... bombs went off on either side of my head, and the sparks set my hair on fire. I was dancing down this ramp and turning around, spinning, not knowing I was on fire. Suddenly I felt my hands reflexively go to my head in an attempt to smother the flames." As a result of the accident, Pepsi gave Jackson $1.5 million, which he donated to a burn centre named after him.